Chances are, you probably use G Suite™ (a.k.a. Google® Apps) for your business needs. G Suite is now used in over 5 million businesses, enabling teams to work together seamlessly from anywhere. But throw in all of the new devices being used in the workplace and SaaS-based apps, and IT has a bit of an ‘identity crisis’: their work is all over the cloud, but their directory service (generally Microsoft® Active Directory®) is firmly rooted on-premises. On the other end of the spectrum, some organizations don’t even have a directory. This approach may be “cloud-forward”, but it also means they don’t have a centralized way of managing and authenticating identities – which is hugely problematic for IT. There is a solution to this madness – and it’s so new that you probably haven’t ever heard of it. Wouldn’t it be nice to scale your company with an increased Google functionality? With our new eBook, which you can download here, you can. For more questions on increased Google functionality, be sure to drop us a note. 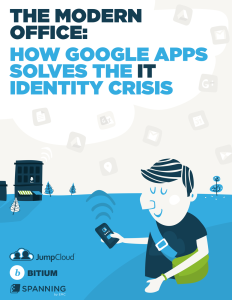 We would love to answer any questions you might have on the IT “identity crisis,” and, of course, consider signing up for a free JumpCloud® account. It comes with ten users free forever, and all of our features are available.